It is a symbol of the never ending cycle. It is a string of beads. The beads are of a kind of seed of dried fruit. It may be made of other material also such as crystal. In Buddhist Tradition, it is a special symbol of Avalokiteswar. It is also a symbol of Prajnaparmita, Chunda, Vasundhara. In Hindu tradition, Brahma, Shiva, Ganesh and Saraswati also carry it. 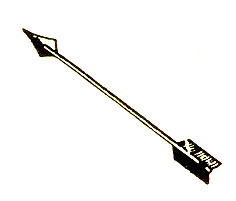 Bana is an arrow. It is the symbol of awareness appears with tantric deities Marici, Kurukulla. 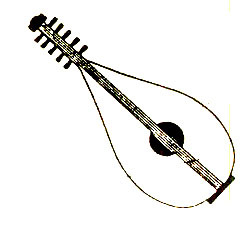 It is a stringed musical instrument. It is a favourite instrument of Saraswati, goddess of wisdom, learning and arts. Chaitya or the Stupa, which represents the Buddhist Universe, is the Buddhist sanctuary, sometimes square and sometimes round, with spires or steps on the capital. Each spire or step represents a haven, the uppermost portion being a point which is supposed to be the highest peak of Mount Sumeru, a mythical mountain whence the Boddhichitta loses itself in sunya. On the four sides of the chaitya the figures of four Dhyani Buddhas Akshobhya. Ratna sambhav, Amitabha, Amoghasiddhi are placed. The place of Vairochana is in the centre. In some Chaitya Vairochana is placed to the east along with Akshobhya. Wheel is a symbol of absolute completeness. In the vedic times the wheel was symbolical of occult powers and symbol of Hindu God Vishnu or Krishna. In Buddhism, it symbolizes the wheel of the law which turns twelve times or three revolutions for each of the four noble truths. It is represented with eight spokes indicating the eight fold path of salvation. It appears often above the image of deities. In Buddhist Vajrayana tradition symbolizes complementary of opposites. Both Sambar and Shiva have the crescent moon as their hair dress.